The mad scientist, Dr. Click here to play! Holzinger, has done it again. He has concocted a slot machine that is truly dynamic in every way, and is paying out at an incredible rate! 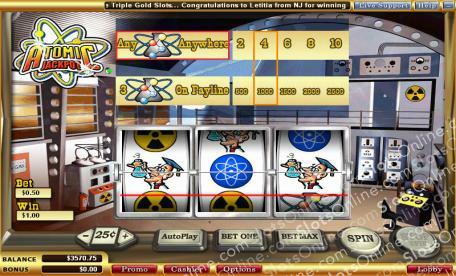 Help Holzinger by taking some of that excess cash off his hands in Atomic Jackpot, a 3-reel, 1 pay-line slot machine. Slots don't come much easier than Atomic Jackpot! Not only is there only one payout line to concentrate on, there are also only 2 different winning combinations. The fact that there are only 3 symbols to play with makes the probability of winning so much higher. You will take a winning every time an Atomic Jar lands on one of the reels, and if you manage to get all three reels to show Atomic Jars your prize will be astronomical! To increase your chances of high returns on each spin, Dr. Holzinger offers you the chance to play anywhere from 1 to 5 coins at a time. That means that if you play 5 coins on a spin and manage to land all three Atomic Jackpots on the center line you will be paid out at 2500 times your stake, in contrast to only 500 times if you play 1 coin. If you are looking for a unique slots experience, then there is no matter place to go than Dr. Holzinger's lab in Atomic Jackpot!